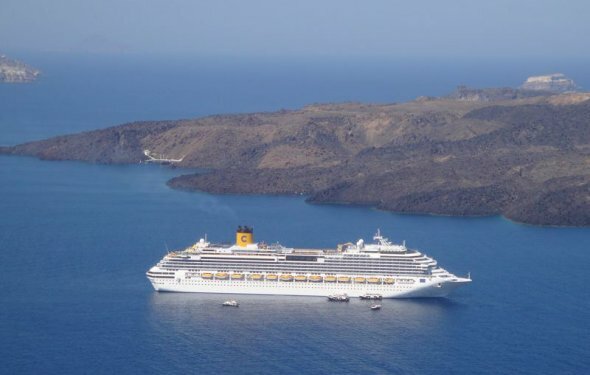 As a cruise region, the Eastern Mediterranean encompasses a broad range of territories that include the Adriatic coast of Italy and Croatia, the islands of Greece, Turkey's Istanbul and Kusadasi, and the Black Sea, which features ports of Turkey, the Ukraine (Crimea) and Russia. Some cruises dip down into what's called the Holy Land, with stops in Cyprus, Israel and - when it's safe enough to do so - Egypt. This region is increasingly one of the most popular in Europe. Its blend of ancient histories and antiquities - along with more laid-back treasures, such as beaches and villages - offers a fantastic array of holiday options. . It's the kind of getaway that can appeal to almost everyone in a diverse group, from kids (who will love donkey rides in Santorini) to history buffs (who will go on and on about their stops in Ephesus). The cornerstone ports for most Eastern Mediterranean voyages are the cities of Athens (served by the port of Piraeus), Venice and Istanbul. In other instances, cruise lines mix a bit of the Western Mediterranean with the Eastern and may start or end voyages in Rome (served by Civitavecchia), Barcelona or Genoa. 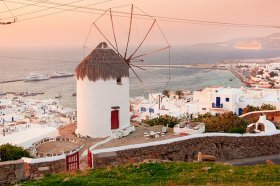 Generally speaking, most Eastern Mediterranean cruises set sail from spring through fall, with the summer high season hosting the largest number of sailings and people. (Prices are also generally higher, due to demand.) Summer's the time, as well, when the region gets hot, hot, hot. Spring and fall offer lower temperatures, better prices and fewer crowds. Winter cruising in the Mediterranean has become more popular, particularly on European lines like MSC and Costa, because sunny skies predominate, and temperatures are moderate, ranging from the 50s to 70s instead of the 80s and higher. You won't have to jostle with peak-season crowds, cruise lines feature longer itineraries with more leisurely schedules, and prices offer more value for your money. When sailing the Eastern Mediterranean, cruisers are spoiled for choice. Big ships tend to visit big ports - the "greatest hits" of the Eastern Mediterranean destinations, such as Venice, Athens and Istanbul. Almost all major lines offer such sailings, including Celebrity, Holland America, Princess, Royal Caribbean and Disney. 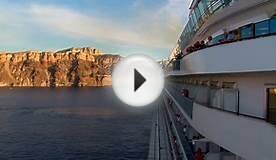 For a more European feel, consider cruising the region with a company based on the continent. Costa and MSC Cruises, both headquartered in Italy, offer shorter and often cheaper itineraries (as well as great pasta). British lines P&O, Thomson and Cunard have numerous sailings, while the German line Hapag-Lloyd provides the ultimate in luxury. 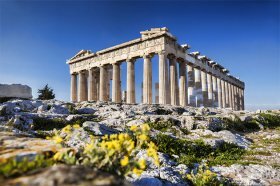 Based in Athens, Celestyal Cruises offers both short and long cruises around the Med and Variety has yacht-style sailings to small Greek islands that aren't served by larger ships, and Noble Caledonia bases its expedition-style Island Sky in the region. Luxury vessels also ply this region of the Med, including Regent Seven Seas, Azamara, Crystal, Silversea, Oceania and Seabourn. Often, these voyages not only visit smaller ports like Hvar, Split, Mykonos, Santorini and Cyprus, but they're longer in duration, also traveling to the Western Mediterranean. The expedition ships that visit this well-trafficked region tend to be those that are heavy on culture, such as Travel Dynamics, Voyages of Discovery and Voyages to Antiquity. Those in search of something different can opt for a yacht-style experience (SeaDream Yacht Club, Windstar and Paul Gauguin) or all-masted ships like Lindblad's Sea Cloud or the ships found in Star Clippers' fleet. Primarily known for its river offerings, Grand Circle also has small ships that it uses on the Dalmatian Coast, as well as in Greece and Turkey. Most itineraries offer a combination of history, culture and beaches, making it easy to cater to a variety of interests and the amount of vacation time you have; you'll find anything from six- and seven-night cruises to leisurely affairs of 20 nights or more. However, some lines and itineraries are more focused on history and culture, visiting places like Venice, Athens, Katakolon (for Olympia), Istanbul, Dubrovnik and even down into Israeli ports that include Haifa and Ashdod (the closest to Jerusalem). Other itineraries might focus more on beaches, water sports and the classic Eastern Mediterranean love affair with fun and sun. 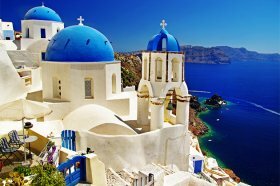 Look for itineraries that are heavy on the Greek Isles, Crete and Cypress. Adriatic Sea/Dalmatian Coast: Generally embarking in Venice, an Adriatic cruise almost always stops in Dubrovnik, with calls on the Italian port towns of Bari and Ravenna, or even more exotic Eastern Med ports like Kotor, Montenegro, or Neum, Bosnia. Shorter versions of these cruises head back to Venice, while longer iterations either continue on to Greece and Turkey (particularly popular for Greece's Gythion and Katakolon, home to the original Olympic games) or travel around Italy's boot, stopping in Sicily or Naples before debarking in Rome, Marseilles or Barcelona. Black Sea: Usually departing from Istanbul or Athens, a cruise to the Black Sea combines stops on the Turkish coast with visits to Crimea (Yalta, Odessa, Sevastopol) and Russia (Sochi, home to the 2014 Winter Olympics). Occasionally, stops in Bulgaria and Romania are also included. For more information, see our Black Sea Basics article. What is the weather in Santorini Greece in January? During January it is Winter in every part of Greece and the whether is cold. Sam vacations on an active volcano in Santorini, Greece. While there she cruises the Aegean Sea on a catamaran and celebrates the island's nightlife with music.